Ever wonder what the most valuable U.S. quarters are? There are many pricey quarters in the coin collecting market, and it’s no surprise, as the 25-cent coin is really the workhorse of U.S. coins in circulation today. The Quarter is used for everything from toll booths to vending machines, and it is usually the highest-value coin given as change during a cash purchase. Quarters have been popular with coin collectors for many decades, but they’ve seen increased numismatic attention since 1999, when the U.S. Mint began releasing new reverse designs every 10 weeks in the 50 States Quarter program. This most ambitious initiative caught on with the public like wildfire, and it was estimated in the early 2000s that up to 100 million Americans were collecting coins. While a lot of the 50 State Quarter buzz has since simmered down, quarter dollars are still widely collected. Though no Washington Quarters rank among the Top 25 most valuable quarters on this list, there are several dates in the Washington Quarter series that are quite scarce and worth hundreds of dollars in uncirculated condition. The quarter was originally issued in 1796 by the Philadelphia Mint and was often dubbed the “2 bits” coin – a reference to its face value of 25 cents, representing two segments of a Pieces of Eight coin. In early times during American history, the Pieces of Eight coin was regularly used as the base currency, often standing in for the official base currency – the silver dollar. The prices listed below among the Top 25 most valuable quarters refer to coins grading Good-4 on the Sheldon Grading Scale, unless otherwise noted. 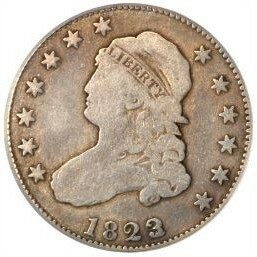 1823/22 Liberty Cap Quarter: $35,000 – The most expensive quarter in a grade of Good isn’t the first quarter ever issued (from 1796) but, rather, an overdate variety from the 19th-century Liberty Cap Quarter series. Many of the early quarters are overdate varieties, as the dies were often reused from earlier years. Some overdates are more common than others, and in the case of the quarter, the 1823/22 is the king of them all. 1796 Draped Bust Quarter: $12,000 – This is the first quarter, and at $12,000 for a specimen in grade Good-4, the deal isn’t bad at all. Very few of the original 6,146 quarters minted in 1796 exist today, and as an important piece of coinage history, this quarter will always have a market. 1870-CC Seated Liberty Quarter: $10,000 – All coinage from the Carson City Mint is scarce anyway, but certain issues from this long-closed mint prove far tougher to find than others. That can be said for the 1870-CC quarter, which saw a tiny mintage of 8,340 and is extremely difficult to locate. Pieces in Mint State Grades have proven virtually impossible to find. 1804 Draped Bust Quarter: $5,500 – Across the board, U.S. coins bearing the date 1804 are in high demand, as most were minted in very small quantities. Just 6,738 quarters sere made in 1804, which is only slightly higher than the number made in 1796. 1901-S Barber Quarter: $5,200 – The key date in the Barber Quarter series, the 1901-S was minted to the tune of just 72,664 pieces which tiny when compared to other 20th-century coin issues. While you should be able to find a 1901-S quarter with a bit of searching, the demand for this scarce coin far outstrips the meager supply. 1873-CC Seated Liberty Quarter: $5,000 – We’re back to addressing the scarceness of those early 1870s Carson City Mint quarters again, and the 1873-CC is definitely a tough coin, with only 12,462 originally struck. A much smaller quantity remains today. 1871-CC Seated Liberty Quarter: $3,450 – Yet another early 1870s Carson City quarter has made this list. It’s impossible to overstate just how scarce these coins are. In this case, just 10,890 were made – only a tiny amount of these survive today. 1916 Standing Liberty Quarter: $2,850 – It’s no surprise this famous Standing Liberty Quarter cracked the Top 10 in a grade of Good-4. There are multiple reasons there is so much allure behind the 1916 Standing Liberty Quarter. For one, it’s a first-year type coin. It also boasts a small mintage of 52,000 pieces. What’s more, it features a scandalous design that exposed Miss Liberty’s right breast – a tiny detail that caused a big stir in the American public to say the least. Miss Liberty was made a little more modest in 1917 by designer Hermon Atkins MacNeil with the addition of a chain mail vest. 1822 25/50C. Liberty Cap Quarter: $2,750 – Another early overdate has cracked the Top 10 of the most valuable quarters. Of course, most type coin collectors won’t give a second thought about collecting overdates like this, but for Bust coin enthusiasts - and there are many in the numismatic community - these die varieties are highly attractive and very rare for the most part. 1913-S Barber Quarter: $1,800 – The 10th of the most valuable quarters on this list is represented by the 1913-S Barber Quarter. Only 40,000 pieces were originally made, and fewer survive today. Making this coin all the tougher is the demand for it – there are simply not enough examples of this coin to satisfy all the people who collect Barber Quarters by date and mint mark.